May 22, 2016. Spring has come to Minnesota…well, we actually had summer back in March, then late winter a week ago, so I’d say spring has come twice to Minnesota, all in the same year. And with spring there is a striking plant that’s putting on green biomass for its big show around July Fourth. Together with fireworks, the large-leaved lupine (Lupinus heterophyllus) puts on quite a display. Here’s a picture of it. Just as in American democracy different personalities and life experiences produce different political outlooks and party platforms, so it is with people’s opinions about the natural world. Here’s what some posted about large-leaved lupine at the excellent Minnesota Wildflowers website (https://www.minnesotawildflowers.info). Broke my heart to read that this is not native. I have some in my garden! I guess it’s time to weed…. I LOVE THIS FLOWER!!! We first started seeing it in our area about 20 years ago. The seeds scatter themselves when they pop open, but we helped them along by collecting and scattering where we wanted them to grow. Now we have a huge area at our cabin north of Grand Marais that is just covered with them. They are so beautiful and the fragrance is delightful!! 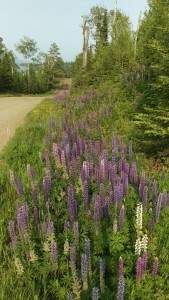 This was a very big year for lupines in NE Minnesota all along Hwy 61 and inland. Although it is an invasive species I do think they are very pretty. Is it legal to dig Lupine from ditches to replant in my yard? If these are so invasive, then why in the heck are they being sold in seed packs at the store…where unknowing gardeners can mistakenly plant them? Sounds to me like DNR is not doing their job…! We have the non-native lupines growing on our septic mound. We are trying to control by cutting the seeds but they are spreading too rapidly. Will this cause a problem for our septic mound? If so, do you have any ideas of how we can safely remove them? What is the harmful effect that Lupine causes? The butterflies seem to love them. I have them in my garden and have a heck of a time trying to keep them alive! I love them, but I have not seen any large amounts anywhere. I am surprised that all the synthetic chemical spraying that is done doesn’t kill them in the roadsides. Thank you. What a range of opinion! How to decide who is right? And once decided, what do you do about it? A young woman who went to college for several years to get a master’s degree in natural resources management, and who for several years has watched the landscape change with the lupine, might have one opinion. 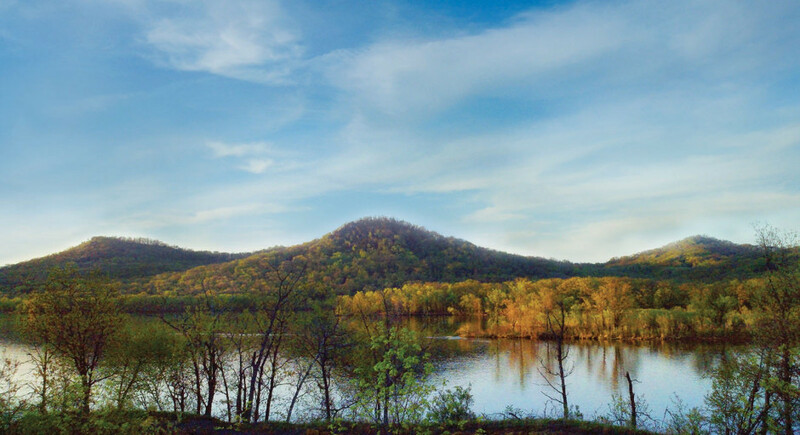 A woman with children who vacations up north, taking in the world through the lens of beauty and enjoyment—fishing, relaxing with family—she will have a different view. Whose view is the trump card? My economist friends would say, you can decide this by figuring out who benefits and who is harmed by the spread of large-leaved lupine. If the dollar value of the benefits is greater than the dollar value of the harms, then go sow your wild oats, but if not, then pull the plant out by the roots. Yes, but how do you put a value on these things? How much does it cost the guy pulling lupine out of his yard versus the dollar value gained by the sight and smell of lupine at your cabin? I don’t know how to do that math. What I do know is that large-leaved lupine, brought from its natural streamside habitat of the Pacific Northwest, has free rein in the Midwest. Its spread is, unchecked, very much like that of any contagion—Zika virus, Lyme disease, the common cold, you name it. It starts with small points of infection, which grow and then start new infections nearby, which also expand and infect new places—until it is everywhere. Over the last twenty-five years I have seen this plant first appear, then multiply and begin to coalesce from Duluth to Grand Portage, up the Gunflint Trail, and last summer I saw the first colonies south of Duluth along Interstate 35. It has begun its march south to the Twin Cities. The well-intentioned woman quoted above, along with other people who love its beauty and scent, have helped it along. Here’s a picture of how the story begins—on two sides of a driveway back to a cabin in the woods. Just pick some seeds from down the road, toss them into the corners of your drive, and you get an adornment, just like the two stone lions you see at the entry to estates. Do the people spreading lupine owe anything to the guy pulling it off of his septic mound? Maybe. That question is asked of a host of environment topics. Do coal-powered plants around the globe, and people like me guzzling electrons as I type this, owe people who fish a payment for the mercury from power plant smokestacks which fish tissue takes up? Do farmers in the Midwest owe the shrimpers in the Gulf of Mexico because farm practices help create a Massachusetts-sized oxygen-free dead zone that has no shrimp? What about the horticulturalists and botanists who brought us Dutch elm disease, European buckthorn, and my personal nemesis, creeping bellflower—what do they owe society for releasing invasive species into the environment? These are heady questions and the answers elusive. My opinion of the lupine is that it is capable of preventing other plants from growing, including seedlings of trees that are important timber trees, like white pine. On the North Shore a couple decades ago I studied the reproductive success of white pine—the mainstay building material from Maine to Minnesota during the lumbering heyday from the mid-1800s to early 1900s. The tree already has problems bringing the next generation along, and it’s possible the spread of lupine into white pine stands will make things worse. It certainly won’t make things better. The most we can hope for is no effect—but who can know? In the face of uncertainty about outcomes, do you double down on an action, or pause to consider? Jim and I find endless fascination in the story of the starling’s introduction to North America by the American Acclimatization Society—a group dedicating to bringing to America all the birds mentioned in Shakespeare’s works. For people who enjoy Shakespeare, that’s a nice concept—completely divorced from any thought of consequences. Today the starling is a genuine problem. Did the enjoyment of the AAS members knowing starlings at last were living here trump the pains taken to get rid of them now? After thousands of stories from around the world of species introductions for a good cause which turned bad in the end, you’d think we would be more thoughtful. Oh for a little ecological education for everybody in high school! Even if all we did was consider unintended consequences and take a precautionary approach, that would be a good start. But in a democratic society, information doesn’t necessarily carry the day. Deeply-held values and the heat of the moment—one’s economic pain, one’s urgent fear, one’s emotional reaction to a recent event—can swing the outcome one way or the other.